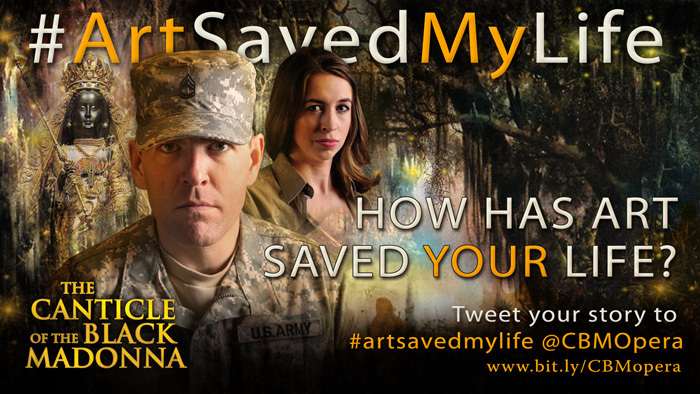 Inspired by Army Infantry veteran Sean Davis, we are launching a new campaign called “Art Saved My Life.” Over the coming weeks, we’ll be releasing pictures and short videos of extraordinary people whose lives were saved by the arts. We urge you to share your story! Simply send a tweet to #ArtSavedMyLife @CBMopera or an email to info@animamundiproductions.com. Together, we can grow the life-saving presence of art around the country and around the world. Join Rocky Ma’nos, creator of PDX Live, actor, and producer as he shares how art saved his life and reveals his support for the new opera The Canticle of the Black Madonna. Join Navy Veteran Joe Cantrell, a combat diver with two tours of duty in Vietnam. Joe shares how art saved his life, enabling him to save the lives of countless others, and reveals his support for The Canticle of the Black Madonna. 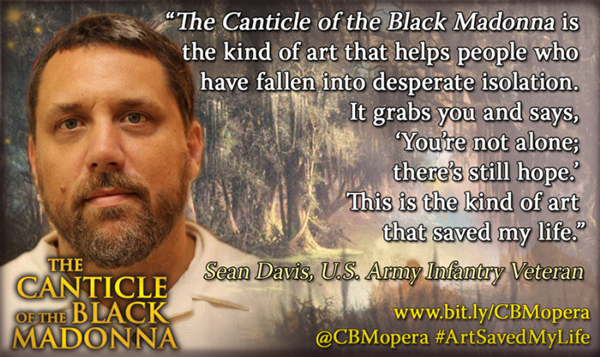 Join Army infantry veteran Sean Davis, professional painter and the author of The Wax Bullet War, as he shares how art saved his life and his support for the new opera The Canticle of the Black Madonna. Join Vietnam Army veteran and Silver Star recipient Bill Ritch, actor and theater director, as he shares how art saved his life and his support for the new opera The Canticle of the Black Madonna. Join “PDX Live” co-producer and military spouse Shelley Kay Ma’os as she shares how art saved her life and her support for the new opera The Canticle of the Black Madonna. Join Joseph Thomas Bailey, Military Veteran, Producer, Writer, and Actor as he shares how art saved his life and reveals his support for the new opera The Canticle of the Black Madonna. Join David Bailey, Military Veteran, Director, Producer, Writer, Musician, and Actor as he shares how art saved his life and reveals his support for the new opera The Canticle of the Black Madonna.